Get your dealership's reviews management process in order with these steps. It's not a secret that car dealerships are in a competitive industry, and the competition is only increasing. This competition is heightened by non-dealer options for buying online, rising marketing costs, and consumers choosing to keep their cars longer. As a result, you need to have the best word-of-mouth and reputation possible in order to keep customers coming back and cars heading off the lot. 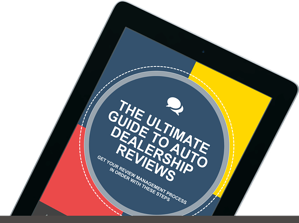 In our ebook, The Ultimate Guide to Auto Dealership Reviews, we analyze the important (and not all obvious) benefits that an online review management process can produce, and provide tons of actionable tips and a checklist to prepare your own reputation management process. Stay up-to-date on email industry advancements and keep your dealership on top of their game. Download our free report!